…especially the honey bees that have taken up residence in one of Will Price’s signature bay windows at Thunderbird Lodge. 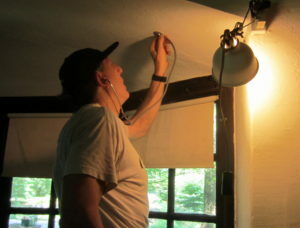 Rose Valley’s best known beekeeper, Jim Castellan, tried to determine the hive’s location inside the wall. Left alone, the hive would could create mold and attract rodents. We are currently trying to come up with a way to encourage our industrious and valuable visitors to move to a more appropriate location on the property. .